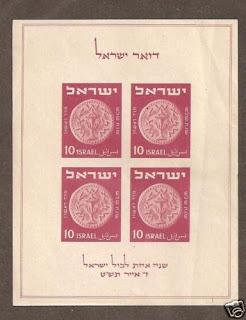 In 1949, Israel held its first national stamp exhibition, TABUL, and issued a souvenir sheet picturing one of its first stamps, which featured an ancient Judean coin (Scott #16). About 95,000 were sold, and Scott '10 prices the unused souvenir sheet at $ 90.00. 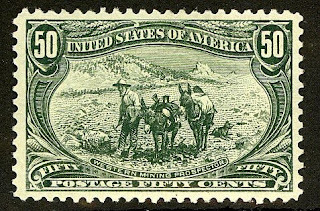 Aside from the sheet's scarcity, it represents an interesting investment as both a "stamps on stamps" and a "coins on stamps" topical, and because of its association with Jewish history. Israeli stamps are popular in Israel and among Jewish collectors around the world. Those interested in learning more about Israeli stamps should consider purchasing a Bale Catalogue, which classifies and values many items not listed in Scott, including forerunners, errors, varieties, machine-vended stamps, revenues, postal stationery, and booklets. Was this sheet issued with gum ot without gum? Are there any fakes of this S/S around? The sheet was issued with gum. I haven't heard of any fakes, nor does Michel warn of any. What is the beast price for buyying?